Based on the award-winning Pro Tools | S6, Pro Tools | S3 is a compact, EUCON-enabled, ergonomic desktop control surface that offers a streamlined yet versatile mixing solution for the modern sound engineer. Like S6, S3 delivers intelligent control over every aspect of Pro Tools and other DAWs, but at a more affordable price. While its small form factor makes it ideal for space-confined or on-the-go music and post mixing, it packs enormous power and accelerated mixing efficiency for faster turnarounds, making it the perfect fit everywhere, from project studios to the largest, most demanding facilities. The Avid Pro Tools S3 Control Surface is a condensed, EUCON-enabled, ergonomic desktop control surface that provides a simplified and multifaceted mixing solution for the contemporary sound engineer. Like its predecessor, the S6, the S3 supplies intelligent control over all the parts of Pro Tools and other DAWs. However, unlike its predecessor, the S3 is retailed at a considerably more affordable price point. The Avid Pro Tools S3 packages massive power and augmented mixing efficiency for speedier processes while keeping a small form factor, making it a perfect match for small space or on-the-go music and post mixing. The Avid Pro Tools S3 mixes the recognised innovations of the Pro Tools S6 with a traditional console layout blueprint. Decidedly intuitive use is ensured, regardless of your degree of experience. Affording a far greater degree of accuracy than a standard keyboard and mouse alone, the user is provided the tangible control needed to fashion superb sounding mixes quicker — from recalling snapshots, altering plug-ins and automating mixes to record-enabling, soloing, and muting tracks. Additionally, when combined with Pro Tools, the user gains the advantage of a speedier workflow and individual features that hasten efficiency every step of the way. If you know Pro Tools, you’ll comfortable with the S3. Not only can you mix sessions using Pro Tools, Logic Pro, Cubase, and other DAWs, it’s also possible to tailor the surface for your assignment at hand thanks to the EUCON technology at its core. 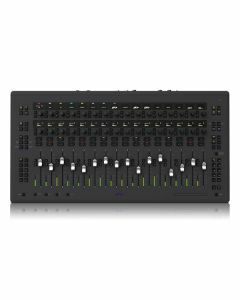 The Avid Pro Tools S3 is perfect for mixing percussion, vocals, discourse, sound effects, and other groupings because the user can build up to 12 custom mixer layouts and recall them to the surface at will. This option to work with whatever you want, and competence to take on any project, is afforded by the capability to easily alternate between applications. Avid’s control surfaces provide a degree of DAW assimilation and versatility that few others can because of this. The Avid Pro Tools S3’s instinctive controls allow you to mix with ease, comfort, and speed, feeling like an extension of your software, with a bounty of rich visual feedback to guide you. These controls include 16 channel strips, each with a touch-sensitive, motorized fader and 10-segment signal level meter and 32 touch-sensitive, push-button rotary encoders for panning, gain control, plug-in parameter adjustments, and more (16 channel control, 16 assignable), each with a tricolour LED function indicator.